Synopsis: The fate of the planet rests on the shoulders of a reluctant Green Lantern and an unstable hero from the future in Justice League vs. 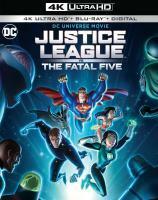 The Fatal Five, The DC Universe Movie title inspired by the classic Justice League/Justice League Unlimited animated series. Produced by Warner Bros. 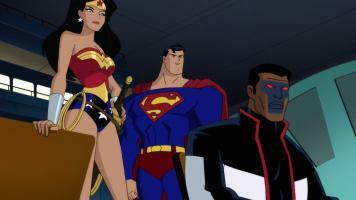 Animation and DC, the feature-length animated film arrives from Warner Bros. Home Entertainment. 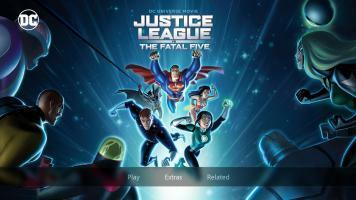 Warner Bros. Home Entertainment brings Justice League vs. The Fatal Five home in a wealth of formats, including Digital, 4K Ultra HD Blu-ray, Blu-ray and DVD, and tosses in a nice heaping of extras. In addition to a fantastic commentary, the home media release offers up two interesting featurettes that explore the new story-telling beats introduced in the movie. Looking at the bonus features, the commentary is a must-listen for fans. 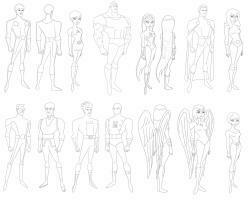 Featuring producer Bruce Timm, producer and director Sam Liu and writers Jim Krieg and Eric Carrasco, the commentary touches upon the film’s production, inspirations and offers up more than a few cool anecdotes and stories from the included crew members. Great bits include how Bloodsport was inspired by current-day conspiracy theorists like Q-anon, the film’s use of language, the score, how it originally started as a Justice League: Crisis on Two Earths sequel, continuity, Carrasco meeting Eisenberg and his goal to try and change the stigma around mental illness and how it’s usually used as a shorthand for villains in entertainment media. It’s an insightful, easy-going and fun discussion on how Justice League vs. 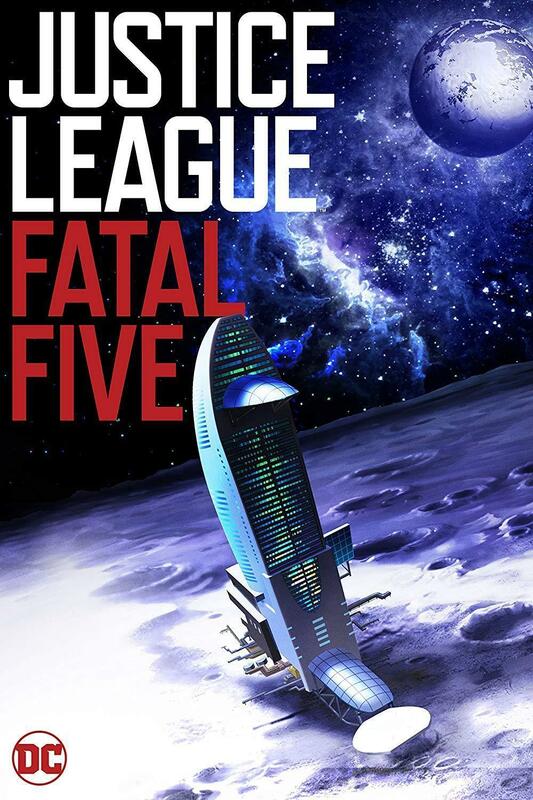 The Fatal Five came to be. The two included featurettes – “Battling the Invisible Menace” (roughly 8 minutes) and “Justice League vs. The Fatal Five: Unity of Hero” (roughly 15 minutes) – look at importance of inclusion, diversity and the struggle of mental illness both on the four-color page and in every day life. The featurettes include members of the film’s creative team, comic book creators and professionals discussing these topics, mixing in their own experiences with the importance of proper representation. On top of a loving nod to the late Dwayne McDuffie, topics include the diverse and inclusive history of the Legion of Super Heroes, influential characters like Oracle, Renee Montoya and Maggie Sawyer, among others, and more. Both are extremely informative and interesting featurettes and will likely hit pretty close to home for some viewers. Also, in the featurettes, keep an eye out for Jim Krieg’s amazing green screen shirt. 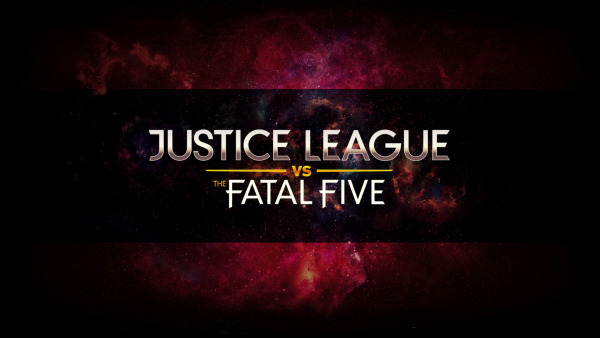 The home media release of Justice League vs. The Fatal Five also includes a preview of the next DC Universe Movie title Batman: Hush. 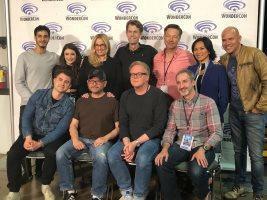 The preview includes a mix of finished animation, comic book artwork and discussion from both the film’s creative team but also DC Comics creators. Other features include an assortment of trailers and previews for Justice League Dark and Justice League vs. 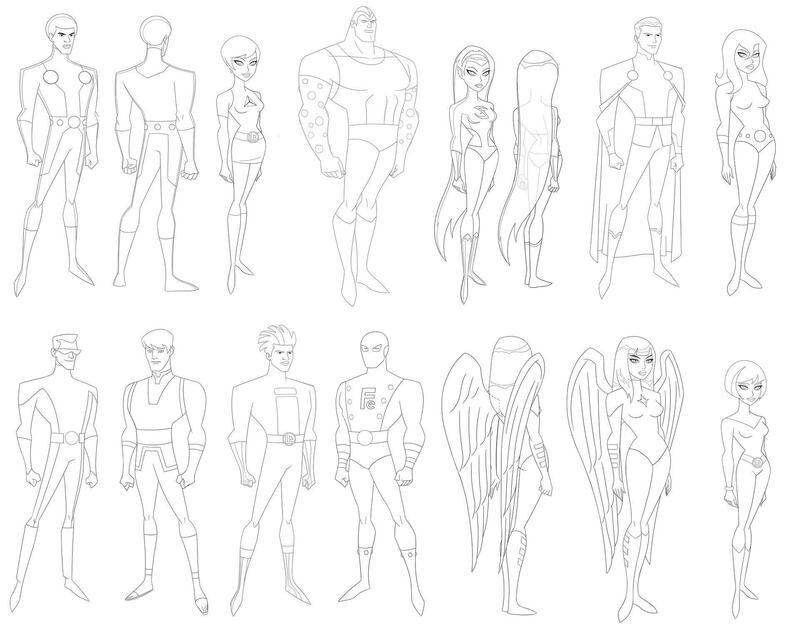 Teen Titans. 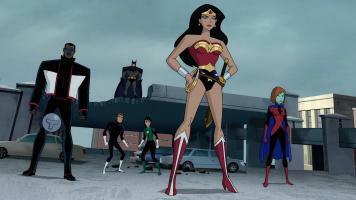 Two bonus episodes – Justice League “Far From Home” and Legion of Super Heroes “Man of Tomorrow are included on Blu-ray release. Anchored by an fun, insightful commentary and two excellent featurettes, Justice League vs. 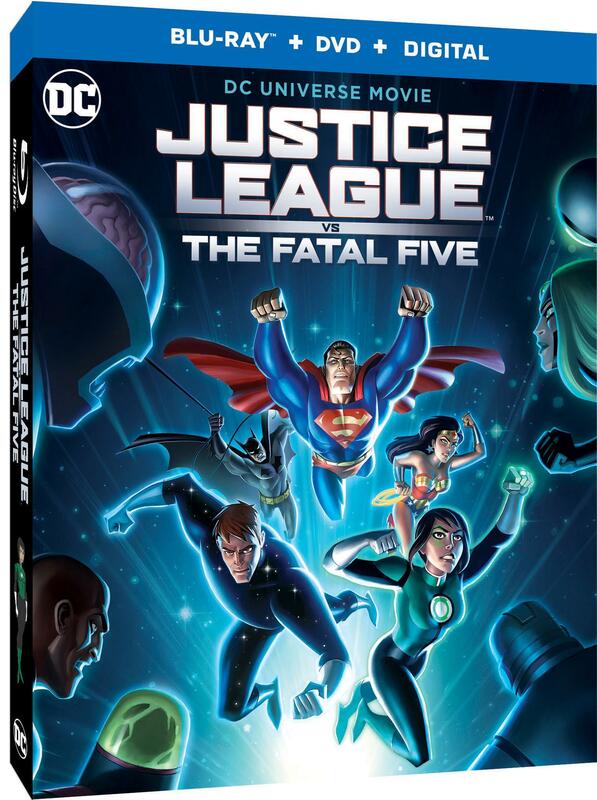 The Fatal Five offers up some great bonus content that support the film’s production and the themes it tackles. Clocking in at nearly two hours, including the commentary, there’s a solid amount of bonus content for fans to flip through after their first viewing of Justice League vs. The Fatal Five. The featurettes, while somewhat brief, do make an impact and will undoubtedly leave an impression on viewers. Viewers hungry to learn more about the film’s production and DC Comics’ overall history with representation will find great material to chew on here. Note: This review is based on the iTunes edition of ‘Justice League vs. 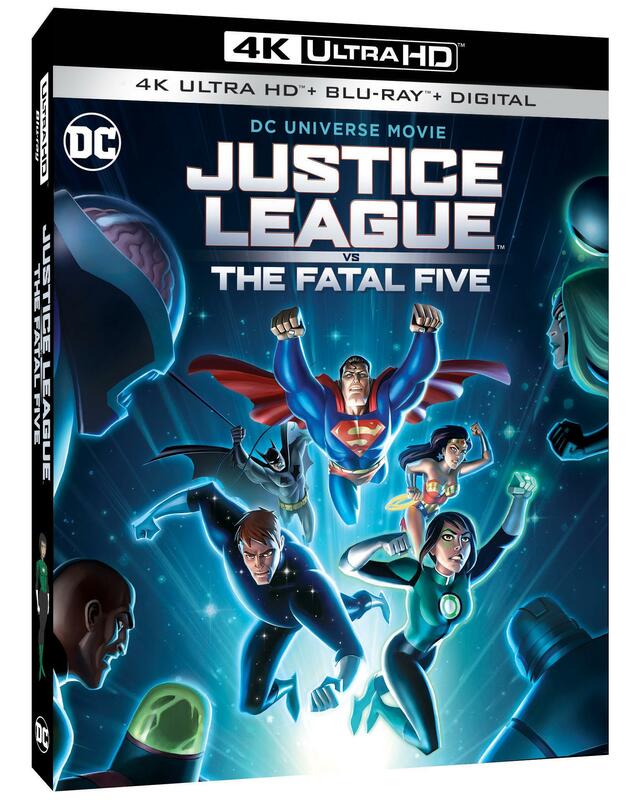 The Fatal Five.’ Please note the review will be updated with a look at the audio and video presentation upon receiving the 4K Ultra HD Blu-ray release. Synopsis: Justice League vs. 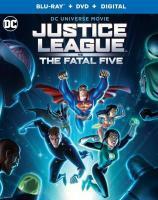 The Fatal Five finds the Earth’s future hanging in the balance when the Justice League faces a powerful new threat – the Fatal Five. Superman, Batman and Wonder Woman seek answers as the time-traveling trio of Mano, Persuader and Tharok terrorize Metropolis in search of budding Green Lantern, Jessica Cruz – whom they need to free remaining Fatal Five members Emerald Empress and Validus in order to carry out their sinister plan. But the Justice League discover an ally from another time in the peculiar Star Boy – brimming with volatile power, could he be the key to thwarting the Fatal Five? An epic battle against ultimate evil awaits! 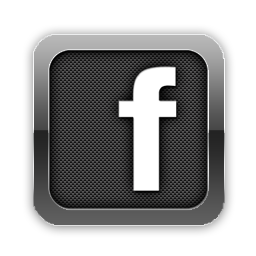 Click above to view more images! 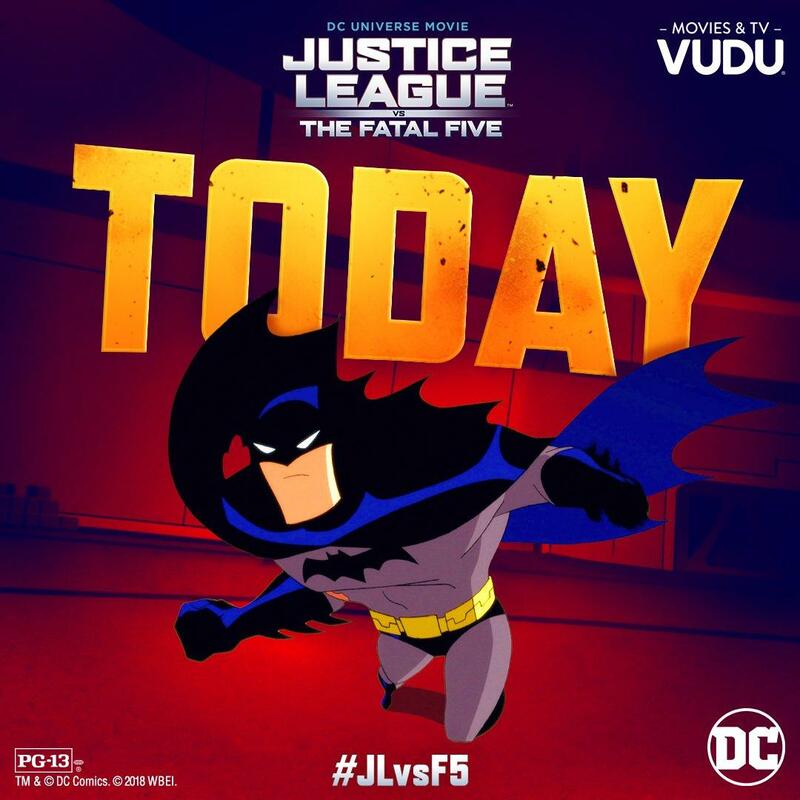 Anchored by compelling protagonists and a riveting story, the Justice League race to stop The Fatal Five from freeing the Emerald Empress and bringing about the end of the world in the DC Universe Movie title Justice League vs. The Fatal Five. In short, Justice League vs. The Fatal Five is a total gem of a movie and a clear love letter from the film’s cast and crew. 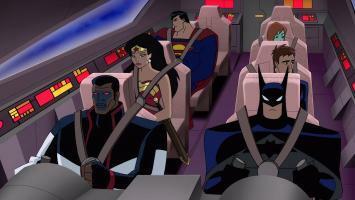 It’s definitely not the Justice League adventure any of us expected, but it’s unquestionably the one we need right now. It emotionally reconnects us to these characters in some new, pretty profound ways, making for an ultimately hard-hitting and riveting adventure that reminds us why we love them so much in the first place. Before this review goes any further, Justice League vs. 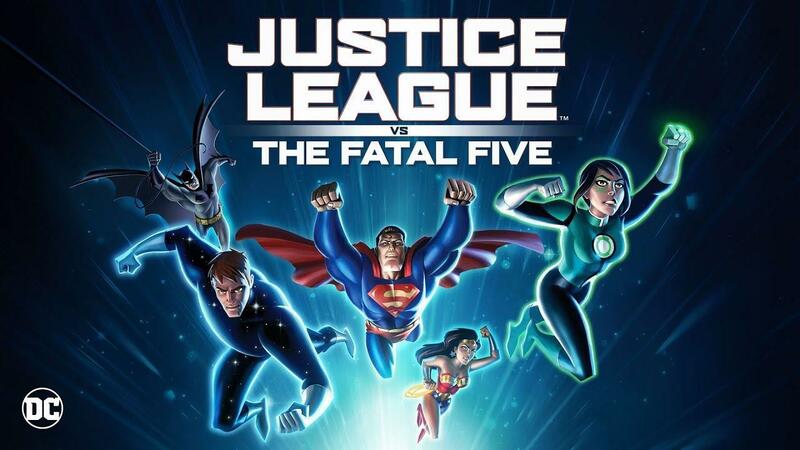 The Fatal Five does indeed take place in the DC Animated Universe (DCAU) continuity, and occurs some time after the series finale of Justice League Unlimited, though the exact time is left vague enough for interpretation. Neat fact, this movie originally started out as a sequel to Justice League: Crisis on Two Earths, according to the movie’s commentary. Also, as usual, spoilers will be as light as possible. Offering up an engrossing story that features the typical superheroics we’ve come to expect while taking an admirably straight look at some serious issues, Justice League vs. 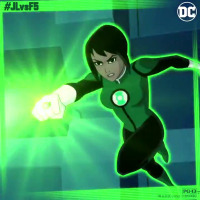 The Fatal Five is an absolutely fantastic movie. While there are a few minor nitpicks to be had – extremely minor – it’s a remarkably well-told story. 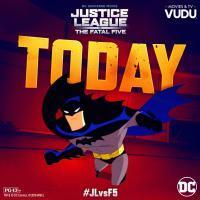 The movie does offer up some pretty sweet Justice League/Justice League Unlimited nostalgia feels (like when the Justice League Unlimited theme just blares during a fist-pumping moment when the League arrives to duke it out with The Fatal Five in a Portland parking garage), but it doesn’t rest on those laurels (and we all know it could’ve). Instead, on top of all the epic battles and clever character work we’ve come to expect from this universe, we also get an extremely relatable and dignified look at the effects on mental illness. Justice League vs. The Fatal Five delivers the flash, but doesn’t leave out any of the substance. It’s a delicate balancing act that could terribly go wrong, but the stellar writing team makes every last bit of it work. Green Lantern Jessica Cruz and Legion of Super Heroes member Star Boy carry the story, with a small selection of A-list Leaguers – namely Superman, Batman, Wonder Woman and Mr. Terrific – and Leaguer-in-training Miss Martian, serving up as supporting characters. The Justice League wants to bring Cruz into the fold while, at roughly the same time, the team is investigates a mysterious orb (which unbeknownst to them contains The Fatal Five) and Batman comes across a John Doe (who’s actually Star Boy) causing a disturbance. Cruz suffers from PTSD due an extremely traumatic experience (which we see play out in a harrowing flashback) and grapples with day-to-day life. Star Boy has a debilitating mental condition and, after finding himself in the past (our present day), is unable to get the medication he needs to stabilize his condition. As a result, he struggles to stay coherent. Every moment these characters are on the screen is utterly compelling. Not once do they come across as ham-fisted or dishonest in that “after-school special” kinda way. They feel … real. Honest. 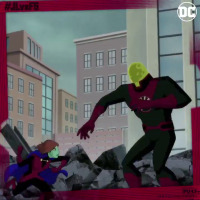 And the threat presented by The Fatal Five feels that much more urgent as we watch Cruz and Star Boy rise to a challenge that they are legitimately not sure they can handle. It adds a new layer to the story that truly resonates. As for the antagonists, the very real motivation behind the team seeking out the Emerald Empress is intriguing, and the switch in motivation when The Fatal Five find her is a great turn. Not only do we get villains driven by a very real, personal goal, but the stakes are also there for those looking for the epic super slugfests we’ve come to expect from the Justice League. It’s these interesting types of character portrayals that really beef up the movie, complimenting a story that plays out like an unproduced episode from the third season of Justice League Unlimited. There are so many elements in Justice League vs. 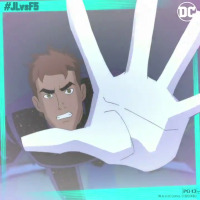 The Fatal Five that ring so true – the character interactions, the sharp dialogue, the hard sci-fi feel, the quiet beats – and it captures the spirit and feel of an episode down to the letter. 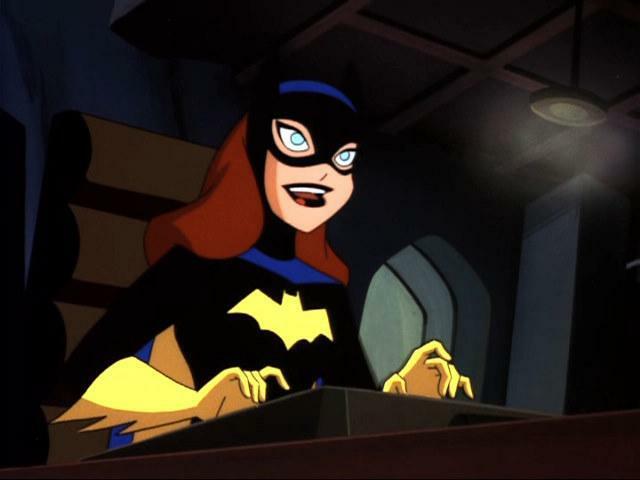 There’s also more than a few winks to the fans as well, including some unexpected cameos and familiar fixtures of the DCAU again (the Javelin!). And the themes addressed here, new to the world of Justice League Unlimited, slip so seamlessly in. The admiration for the fan-favorite animated series here is clear as day, and it ripples out in the creative choices of the film’s creators. The writing and directing for Justice League vs. The Fatal Five sync nicely. Producer and Director Sam Liu definitely delivers on the action, with well-staged fisticuffs that play hard and heavy. Characters don’t hold back, and you can feel each thrown punch or swift kick. And yes, given the PG-13 rating, some of the sequences do get a little more intense than expected. Liu also knows when to let the cast shine even in those quieter moments. This is especially effective for Cruz and Star Boy, as we not only get a better understanding of who they are as characters, but how their respective situations influence their superheroics. Whether it’s during a bombastic set piece or letting the camera linger so we can understand what they’re experiencing, Liu nails every shot. The main Leaguers also get a hefty amount of great beats that ring true, such as Superman saving a young boy from impending doom or Wonder Woman trying to coax the warrior out of Cruz. This all comes out through a superb script by Eric Carrasco, Jim Krieg and Alan Burnett. Their respective work blends together so well, feeling like a true collaborative effort by all three where each of their strengths come together into a strong, cohesive story. With luck, this won’t be Carrasco’s last effort in the DC Universe Movie line, as his sensibilities with modern issues and themes bring a welcome new touch. 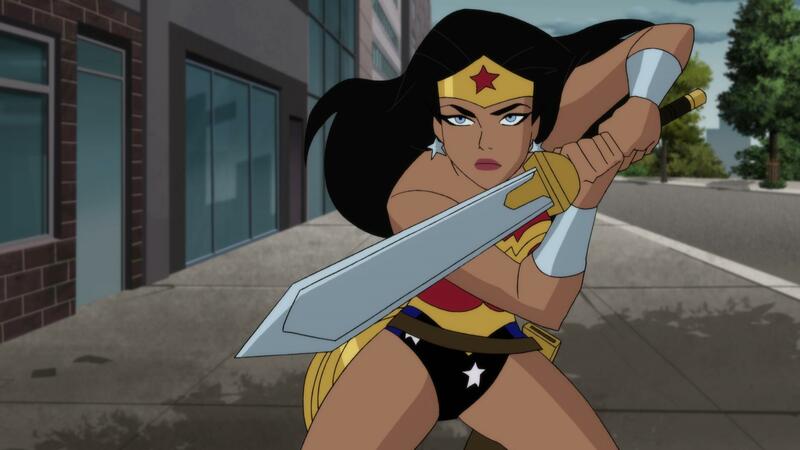 Kevin Conroy, George Newbern and Susan Eisenberg return to their iconic roles as Batman, Superman and Wonder Woman and, honestly, they haven’t missed a beat. Conroy sounds as great as ever as The Dark Knight, effortlessly switching back between Dark Avenger and snarky quipster. Newbern brings a welcoming quality to his Superman performance, coming across as a strong, caring authority figure. Eisenberg? She is Wonder Woman, make no mistake. Her performance is almost indescribable because of just how well she brings the character to life. The compassion is there, but so is the warrior. There’s even one scene early on – where Wonder Woman is confronting Cruz – and Eisenberg just effortlessly brings those qualities out in her performance. And hearing these three interact with each other? Pure gold. The relationships feel so real, so lived in and so palpable. Diane Guerrero brings Cruz to life in a very real, very grounded way. You can hear the trembling and doubt in Cruz’s voice as she struggles, but when she stands tall and confident? It’s absolutely riveting. When Cruz recites the Green Lantern oath? Just … wow. Elyes Gabel does great work with Star Boy, too, selling his confusion and deteriorating state. It’s clearly a difficult role, but he makes it work. Track his performance from start to finish, you’ll see. Daniela Bobadilla brings a youthful energy to the teen-aged Miss Martian, adding some much needed levity to the serious proceedings, even if her role doesn’t really seem to really extend beyond that. Kevin Michael Richardson gets to show off his superhero chops as Mr. Terrific, and does a solid job, but Green Lantern: The Animated Series fans will definitely be glad to hear him also providing the voice of Kilowog again. It’s a strong cast all around, with everyone clearly having fun and getting to flex their acting chops with the meaty material. Hats off to Wes Gleason for his commendable voice direction work here, too! 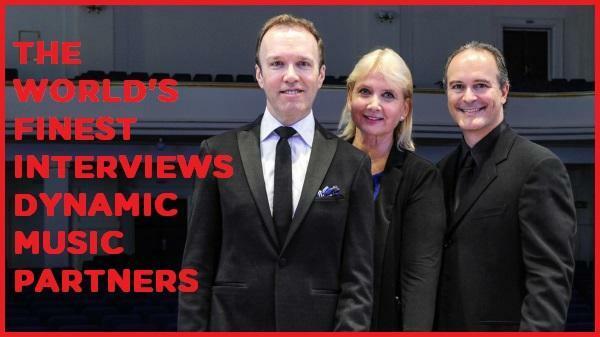 Dynamic Music Partners provide the score and, hands down, it’s an incredible piece of work. The music during Jessica Cruz’s flashback? Creepy and chilling. During the action sequences? Huge. Turn the speakers up. Whether it’s a quiet moment, a set piece, or a quiet contemplative moment? They nail it all. And yes, you will hear more than a few familiar themes. 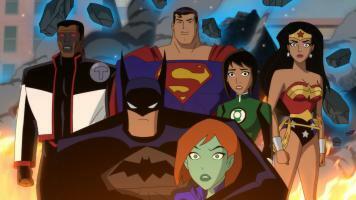 Justice League Unlimited? Oh yeah! Justice League? Yup! And that’s not it! They lace their score with so many surprises and nods, but not once does it sound gratuitous. It’s all organic. This is one movie that screams for a soundtrack release. The animation in Justice League vs. The Fatal Five, provided by DR Movie, is fairly solid though occasionally inconsistent at times. There are a few moments here and there where the quality dips down – stiff or rough character movements, for example – but overall it’s pretty infrequent and not really a distraction. And while Justice League vs. The Fatal Five is a heckuva great time, it does stumble a little, though any perceived missteps are minor. The PG-13 language occasionally feels out of place and the pacing is a little off at the beginning of the movie, particularly as it skips around to establish the film’s set-up. There’s also a slight time jump, which just comes out of nowhere in a pretty ‘off the cuff’ fashion, which likely should’ve been more pronounced. Further, Batman seems to possibly miss a rather substantial clue about Star Boy’s identity when they first meet, though it’s hard to tell due to some tricky animation. It also would’ve been nice if a bit more time was devoted to Cruz and Star Boy’s back story, but what we get is still enough for us to grasp and sympathize with their respective plights. More background on Miss Martian also would’ve been appreciated. Despite any minor shortcomings, Justice League vs. The Fatal Five remains a compelling adventure. The story and character choices provide an ingenious direction in which to re-establish the universe we know while also looking ahead to the future. Letting a character like Jessica Cruz be the center of Justice League vs. The Fatal Five offers up a fresh and unique perspective that hasn’t been explored in this world yet. Plus, having the film take place in familiar surroundings makes it easier to introduce new themes without it feeling like the viewer is taking on too much. Justice League vs. The Fatal Five reminds us why we love this spin on the classic DC Comics characters while also showing there is still so much left to explore. The script delivers both new faces and interesting new ideas to tackle, and it’s invigorating to think where future DCAU adventures could go if Warner Bros. Home Entertainment opt to revisit. For DCAU fans, this film is Must Own, without hesitation, but it also presents an interesting new perspective on the superhero experience that new viewers will gravitate to. All said, Justice League vs. 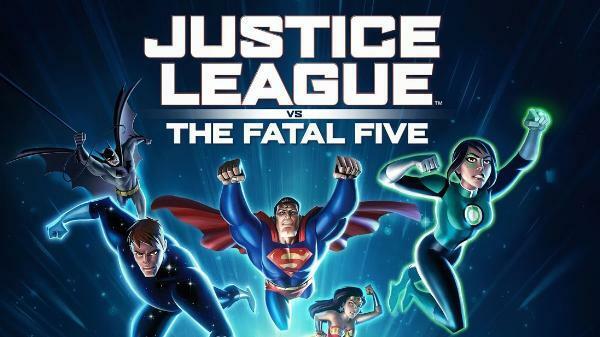 The Fatal Five is not only an excellent installment of the DC Universe Movie line in it’s own right, but also a welcome return that does the DCAU justice. And after watching it, fans will be definitely looking forward to more! Click on the links below for review coverage of Justice League vs. The Fatal Five. 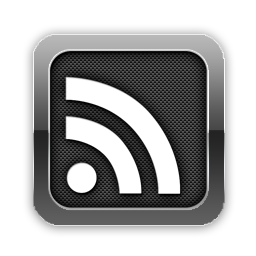 Reviews include exclusive content, along with images and additional details. Please note the reviews are the opinion of the author, and do not represent any other entity. Continue below for more. 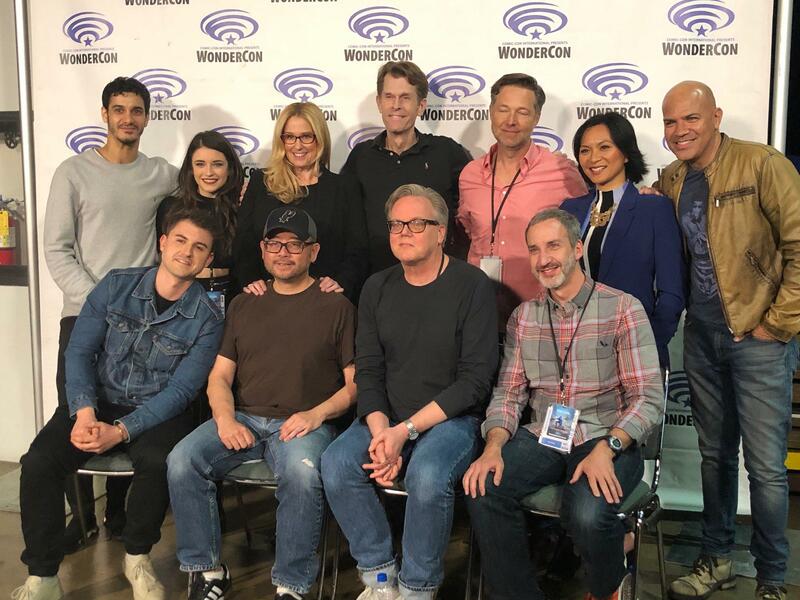 Warner Bros. Home Entertainment has released details on its forthcoming panels planned for WonderCon 2019, including the world premieres of both the DC Universe Movie title Justice League vs. 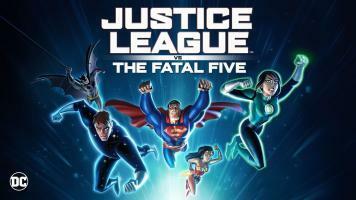 The Fatal Five and the DC Animated Movie Batman vs Teenage Mutant Ninja Turtles. Fans will also get an opportunity to meet creative and voice talent from both respective features. Press details, along with the first clip and new images from Justice League vs. 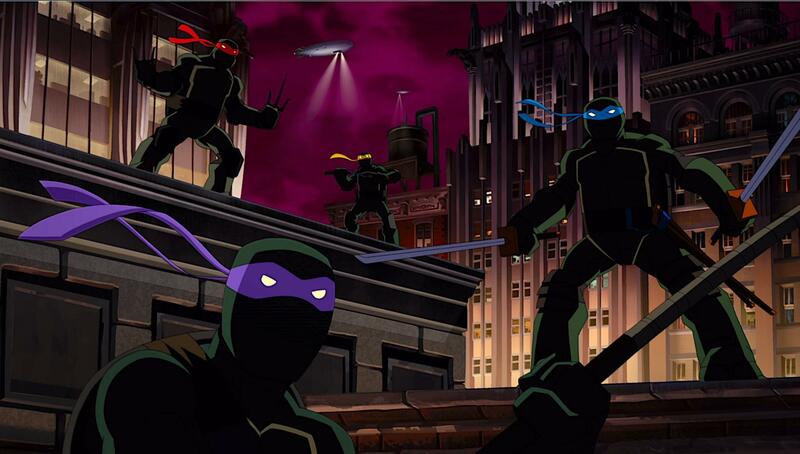 The Fatal Five and a new image from Batman vs Teenage Mutant Ninja Turtles, can be found below. Fun fact – the Justice League vs. The Fatal Five clip was hand-picked by Bruce Timm! Keep an eye on the Justice League vs. 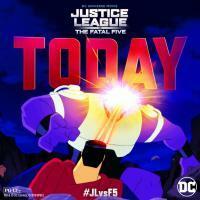 The Fatal Five subsite right here at The World’s Finest for additional and exclusive content, and much more. 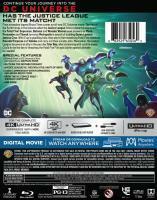 The next installment in the DC Universe Movie line, Justice League vs. 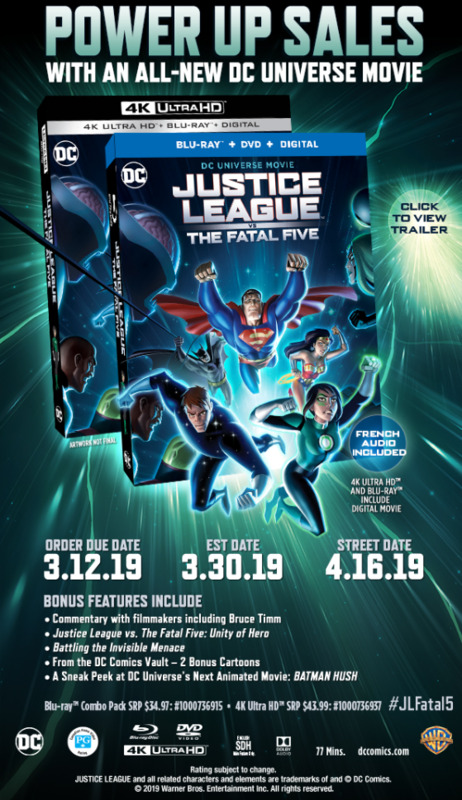 The Fatal Five hits digital media on March 30, 2019 and physical media on April 16, 2019. 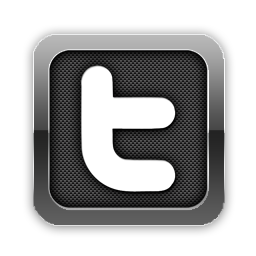 Also check out the Batman vs. Teenage Mutant Ninja Turtles subsite right here at The World’s Finest for additional and exclusive content, and much more. The DC Animated Movie title Batman vs. Teenage Mutant Ninja Turtles hits digital media on May 14, 2019 and physical media on June 4, 2019. Click on the links below for discussion and more. Discuss Justice League vs. 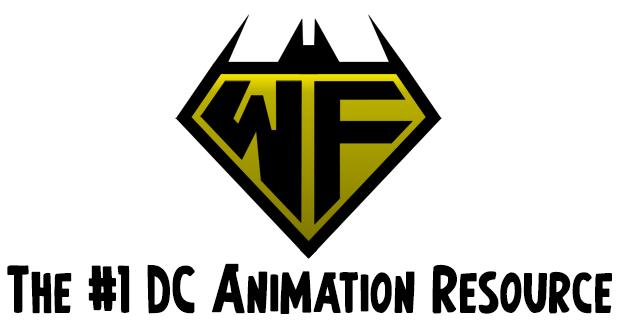 The Fatal Five at The DC Animation Forum! Discuss Batman vs. Teenage Mutant Ninja Turtles at The DC Animation Forum! Featuring additional content from the Justice League vs. 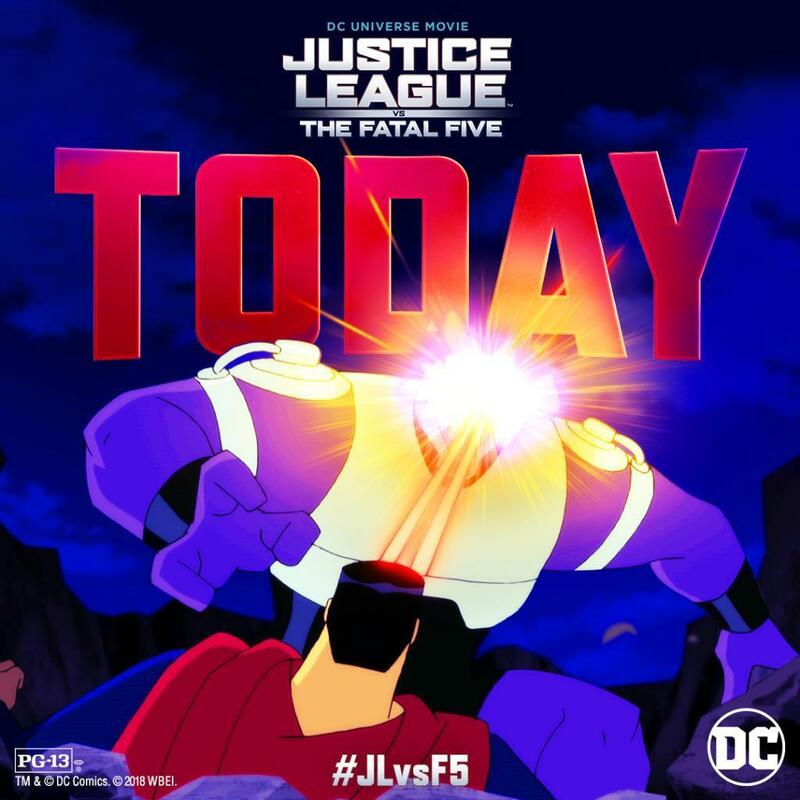 The Fatal Five animated feature from Warner Bros. 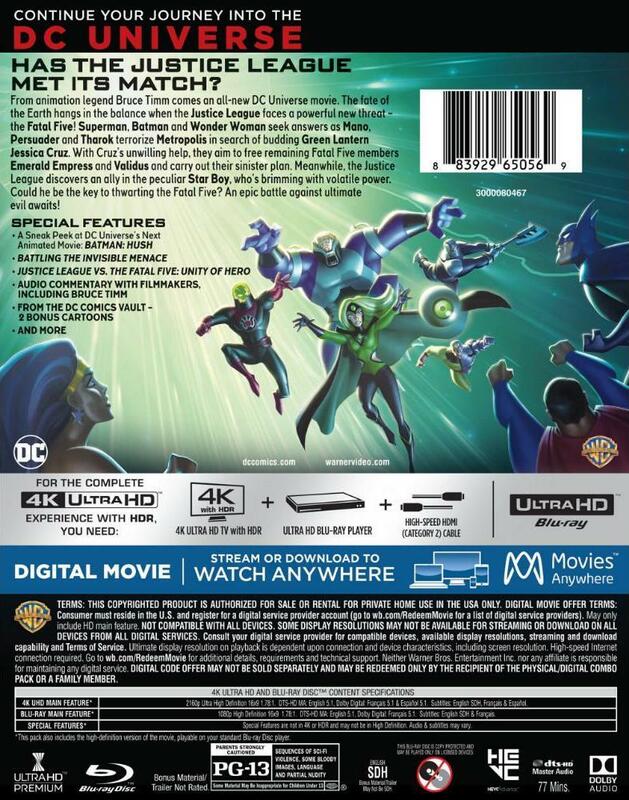 Animation and Warner Bros. Home Entertainment, this section includes exclusive content, image galleries and archived material – all of which is focused on the production of Justice League vs. The Fatal Five.